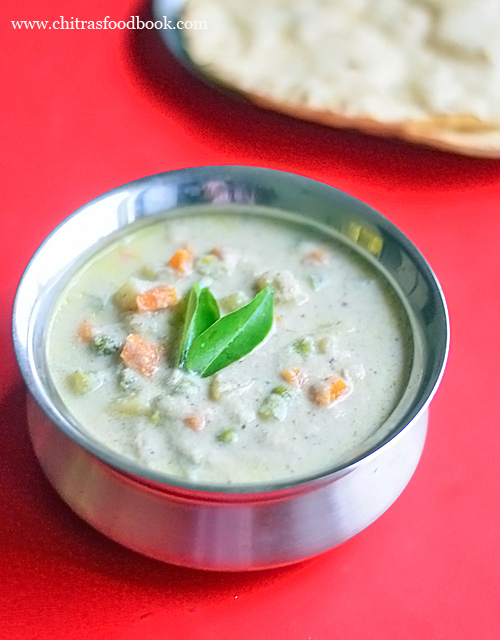 Saravana bhavan hotel style white kurma for idiyappam and chapathi was my long time pending readers requested recipe. 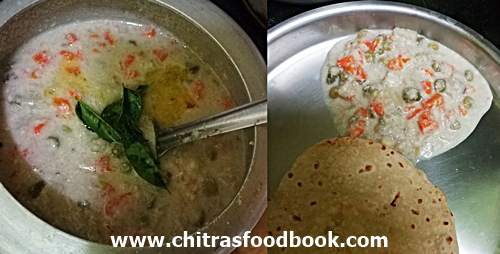 My friends and readers who had tried my Saravana bhavan vegetable kurma for parotta and chapathi asked me to try and post Saravana bhavan white kurma recipe that is served for Idiyappam. As I have not tasted it in that restaurant, I had no clue about it. Recently when I was going through my cook book collections, I got this hotel style white kurma recipe (vellai kurma in Tamil) from Aval vikatan’s supplementary book – 30 hotel recipes. Most of the recipes in that book are fool proof ones. So I tried this recipe confidently. It was captioned as hotel vellai kuruma. In the original recipe, it is mentioned to saute the spices, garam masala ingredients, cashews and coconut in little oil before grinding. When I tried the same, I felt the color of kurma was not perfect white in color instead it was on yellowish side. So I tweaked the recipe slightly and made it in a pressure cooker to ease my job. Voila! it was done under 15 minutes. The best part of this kurma is its prepared without onion. You can skip garlic too. 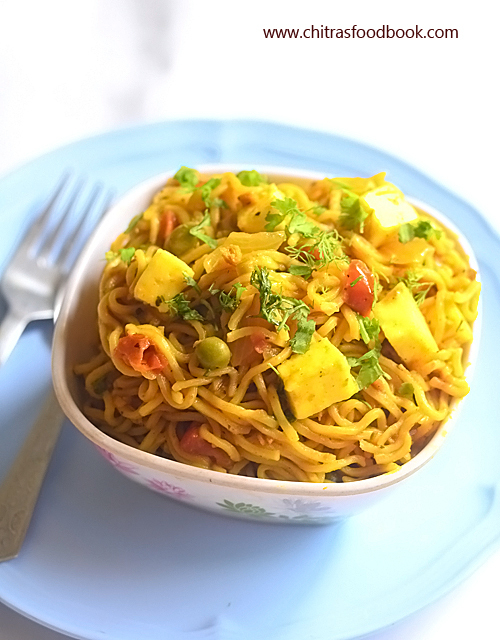 If you have chopped vegetables in hand, making this kurma is so easy. Its a good side dish for idiyappam, chapathi, appam and dosa too. Yes, I liked it with dosa as well. You can make it for your dinner quickly. 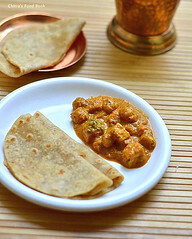 Chettinad vellai kurma recipe is also similar to this. Friends, do try this white kurma recipe and share your feedback with me. Lets check how to make hotel Saravana bhavan style white kurma recipe with step by step pictures. 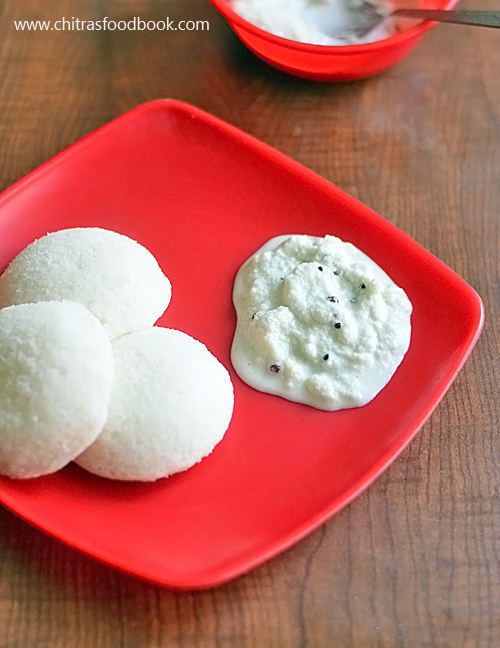 Check out my Saravana bhavan white coconut chutney recipe too ! Wash and chop all the vegetables and set aside. Grind the ingredients under “To grind” to a smooth paste. Heat oil in a cooker. Saute bayleaf, black stone flower. Add chopped vegetables, sugar, salt and mix well for a minute. Add the ground masala paste, saute quickly without changing the color. Add 1 cup of water and pressure cook in low flame for one whistle. Remove the lid after the steam is released. Temper curry leaves in ghee and add to white kurma. Mix well and serve hot with idiyappam and chapathi ! Wash and chop the vegetables finely and set aside. Grind all the ingredients given under “To grind” to a smooth paste adding required water. Heat coconut oil in a pressure cooker base. Add bayleaf, black stone flower and mix well. Add the chopped vegetables, sugar, salt and mix well for a minute in medium flame. Now add the ground masala paste and mix quickly. Add 1 cup of water. Mix well and close the lid of pressure cooker. When the vapor starts to come out, put the weight valve and reduce the flame to low. Pressure cook for one whistle in low flame. You will get a nice smell. Switch off the flame. Remove the cooker lid after steam is released. If the kurma is too thick, add some water and give one boil. Heat ghee in a kadai and splutter curry leaves. Add to kurma and mix well. 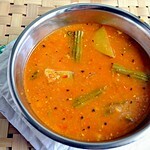 Mix and serve hot with idiyappam and chapathi. Hotel Saravana bhavan style white kurma is ready. Enjoy ! For variations you can saute the spices in oil before grinding to a paste. It gives a different flavor but color may be dull. You can make this kurma with potato alone. You can also add one chopped tomato but color of kurma may vary slightly. This kurma tastes mildly spicy. So add more green chillies for spicier taste. 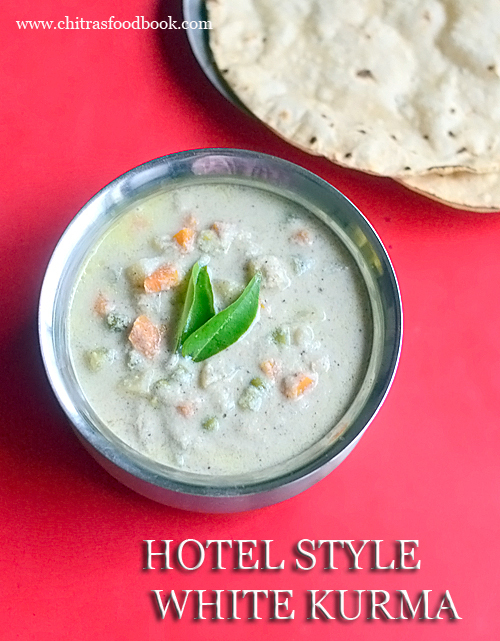 Try this yummy, hotel style white kurma recipe. You can pair it with idiyappam, appam and chapathi. I loved it with dosa too. 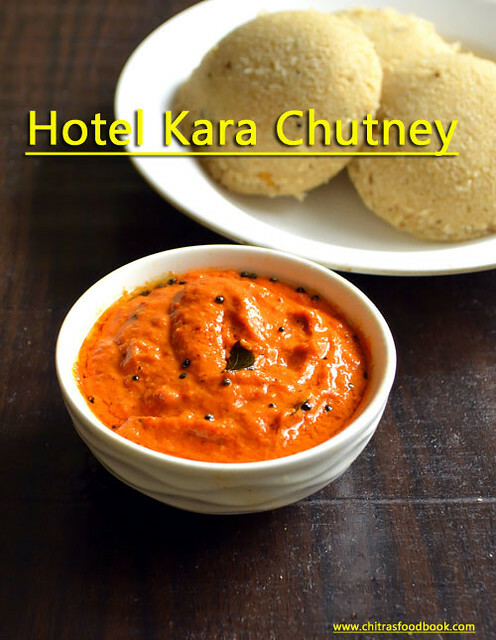 Bangalore hotel style coconut chutney /Karnataka hotel style chutney is one of the most requested recipes from my readers. 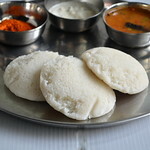 In Karnataka, most of the hotels serve this type of coconut chutney for breakfast recipes like idli, vada, dosa, kharabath , shavige bath and even for vegetable palav. It is known as Kayi chutney or tengina kai chutney (coconut chutney) in Kannada. Me being a biggest fan of Karnataka breakfast recipes, love this hotel style chutney and sambar equally. I have tasted this coconut chutney in many restaurants like Adigas, Darshini, SLV, Krishna bhavan, Brahmins coffee bar and in many more small food joints. It a basic, no cook coconut chutney recipe that can be prepared with easily available ingredients. When my readers asked me to try and share this Karnataka hotel style chutney, I started trying it with various combinations. But I was not satisfied. Then my School moms group friend Tara shared her coconut chutney recipe along with hotel secrets. She told me to grind the chutney thick and slightly coarse. I followed her recipe and tips. Viola I made Bangalore hotel style coconut chutney successfully at home👌 !! It tasted very close to it. Raksha liked it very much and gave a big thumbs up👍. Whenever I take a parcel of Mysore masala dosa from hotels for Raksha, I used to watch the kitchen activities. I found coconut chutney is ground thick and then they add water to dilute it before serving. They use thick chutney for parcel and thin watery chutney for serving. So I too followed the same technique and I am quiet happy with the results😊. Today I have shared the coconut chutney recipe with basic ingredients that is used in most of the hotels here. You can alter it based on your liking. 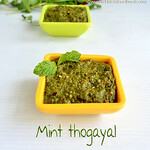 Color of this chutney may vary in hotels based on the quantity of coriander leaves to make it bright green or light in color. In some hotels, they add a pinch of sugar too. You can also serve it thick or thin as shown in the pictures. For brahmin coffee bar chutney, make the same by skipping garlic. To make chutney like Veena stores, Malleshwaram grind all the ingredients except greens ( coriander leaves,curry leaves), skip turmeric powder and add the greens at the end. Grind it coarse. Add water and dilute it. So please change the grinding method and quantity of ingredients as per the hotel you like. However you make it, this chutney tastes great. Ok, lets see how to make this basic Bangalore hotel style coconut chutney recipe with step by step pictures. 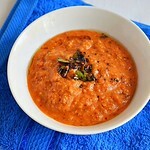 Check out my blog’s most popular hotel style vegetable palav recipe too. 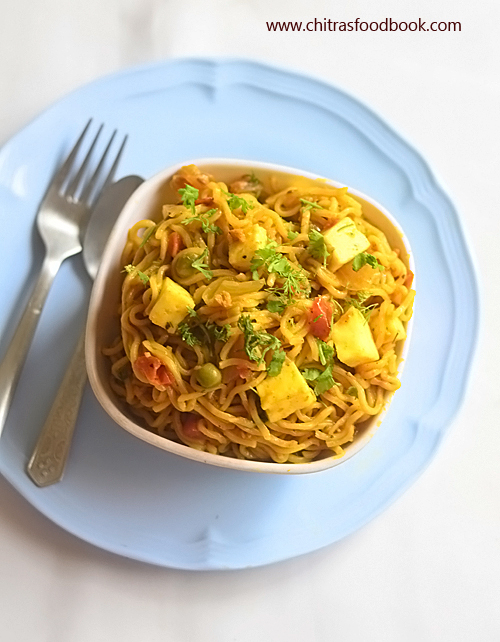 In a mixie jar, take the grated coconut and other ingredients. Add the required salt, a pinch of sugar & turmeric powder (optional), little water. Grind thick and slightly coarse in texture. Remove in a bowl and temper the chutney. Take the required chutney in a bowl. Add water to dilute it. 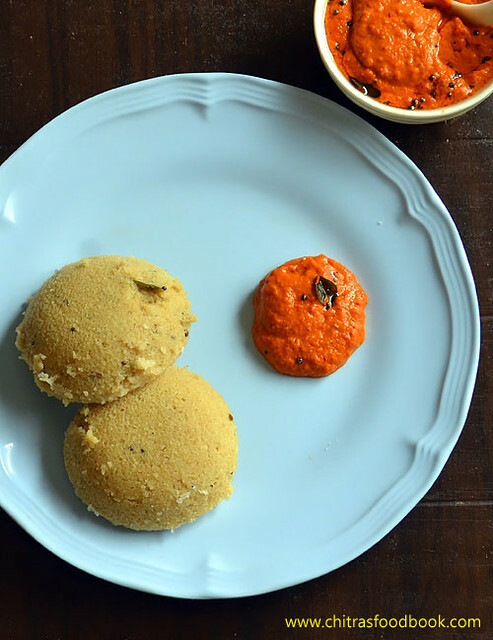 Serve with idli, vada, dosa and kharabath in a round plate like hotels. Take the grated coconut, green chilli, fried gram dal, garlic cloves, tamarind, curry leaves, coriander leaves, mint leaves, a pinch of turmeric powder (for bright green color as shown in the pictures, optional), sugar, salt and little water. Grind everything to a thick, slightly coarse paste. For this, run the mixie for small intervals. Do not grind it continuously. You should be able to see the greens here and there after grinding.Altervatively you can grind all the ingredients except greens coarsely. Lastly add the green leaves and grind it. Remove the thick chutney in a big bowl. Temper mustard seeds, red chilli in a small kadai. Add to chutney and mix well.. You can serve it as such for thick chutney. For thin watery chutney, take the required amount of chutney in a bowl. Add 1/4 cup or required water to make it thin as you like. Mix well , add salt if needed and serve with idli vada, dosa and kharabath. Tastes great ! Enjoy ! PS : Color of the chutney looks white due to bad lighting. Soon I will replace the step by step pictures. 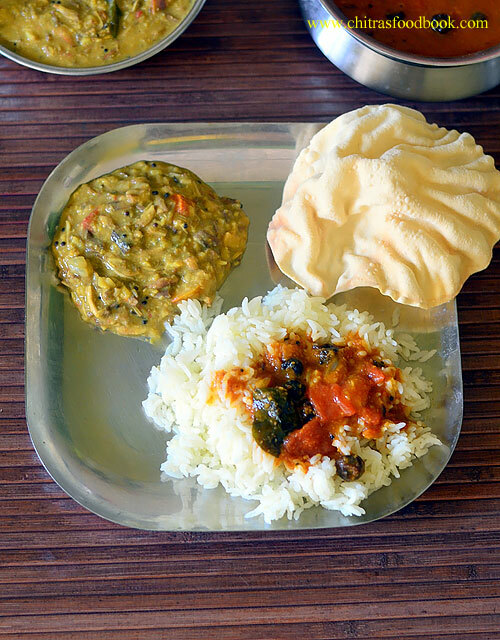 For variations you can use equal quantity of coconut and gram dal. Do not skip garlic. In most of the hotels garlic is used. A pinch of turmeric powder should be used to get this bright green color. Cumin seeds also give a nice flavor. Adjust the quantity of green leaves as per your taste and color of chutney. In some hotels, they add less to make it white. Do not add more curry leaves and mint leaves. Quantity of coriander should be more. Do not grind too smooth. Taste and flavor varies. 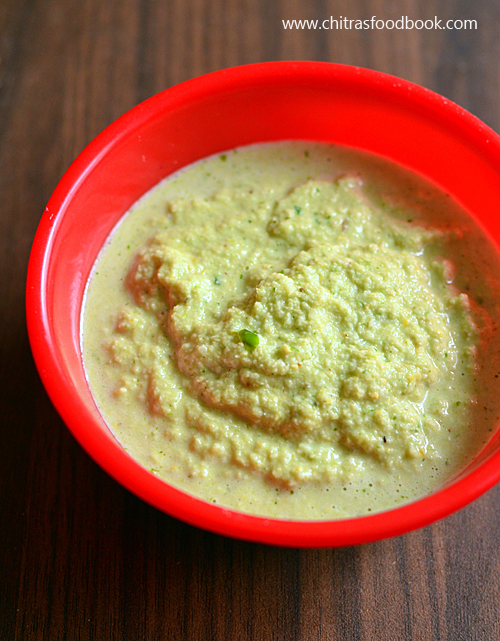 Try this yummy, Bangalore hotel style coconut chutney. You will love it ! 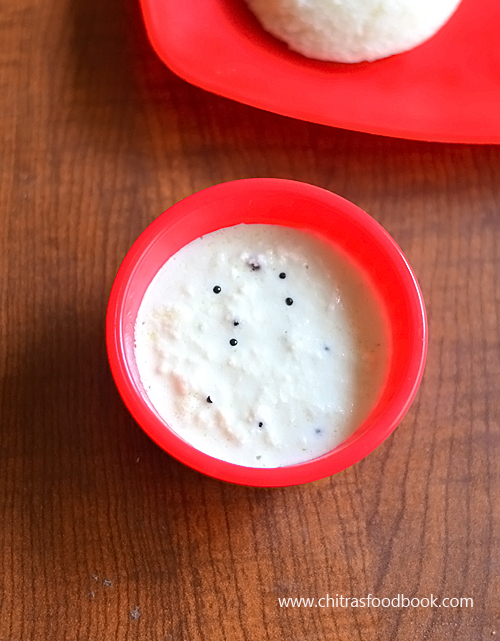 Hotel style coconut chutney (thengai chutney in Tamil) popularly known as white chutney is a very simple chutney recipe with minimum ingredients. 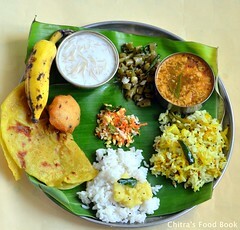 In Tamil nadu, it is served as side dish for idli, dosa, pongal, vada and other South Indian tiffin recipes. 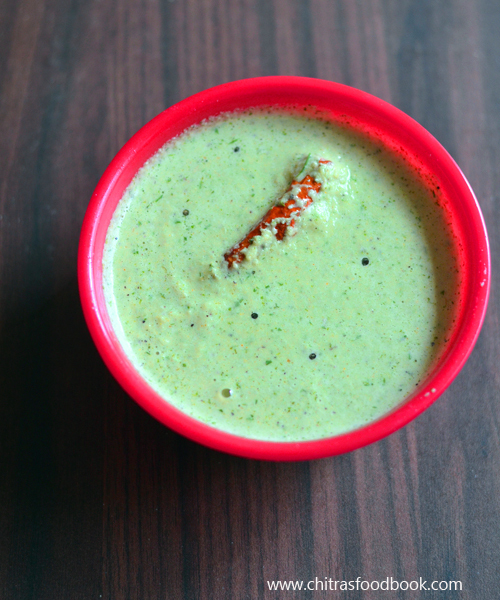 After going through so many websites and YouTube videos, I tried this restaurant style coconut chutney recipe at home. As I expected, it looked and tasted very similar to the hotel white chutney. In popular hotels like Saravana bhavan, Adayar Ananda bhavan they serve this kind of coconut chutney. It looks super white in color and slightly loose in consistency. It doesn't taste spicy at all instead it tastes mildly sweet too. Many people says coconut chutney in hotels is prepared using Thengai punnakku (Coconut oil cake/ coconut residue) , Kadalai Punnaku( Groundnut oil cake) and pottukadalai / roasted chana dal as they are low in cost when compared to fresh coconut and yield of the chutney is more. Yes it may be true with small food joints where the chutney looks pale white in color. Some hotels use milk or coconut milk to grind the chutney which helps to bring white color even with the same ingredients. Some people also add a dash of ginger or garlic and small onion for flavor enhancements. However it is prepared, we all love hotel type coconut chutney recipe, isn’t it ?? 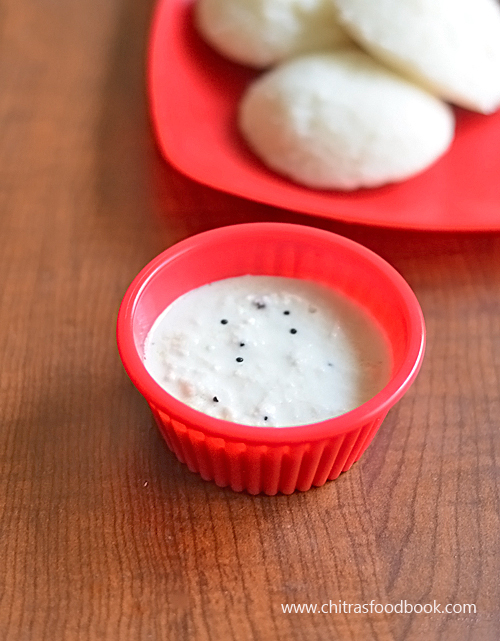 So today I have shared the basic white colored coconut chutney recipe without roasted chana dal. Lets see how to make it with step by step pictures. 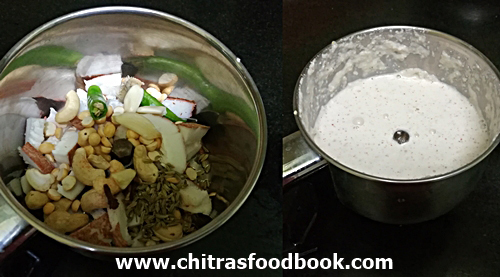 I have also shared few tips at the end of this post to make white colored coconut chutney. Very soon I will share Karnataka hotel style coconut chutney recipe which is completely different from this recipe. 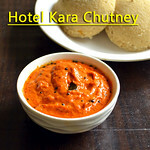 If you are interested, please check my hotel style Kara chutney recipe / Red chutney too ! Grate the white part of fresh coconut. Take grated coconut, green chilli, cashews, salt and water. Grind to a thick, smooth chutney. Temper mustard seeds and urad dal in oil. Add to coconut chutney. Mix well and serve with idli, dosa. Grate white part of the coconut. Do not use the brown part. In a mixie jar, take the grated coconut, green chilli, pinch of tamarind (optional), cashew nuts, salt. Grind to a coarse paste without water. Now add the required water and grind to a thick, smooth chutney. Transfer to a bowl. Heat oil in a small kadai. Temper mustard seeds, urad dal and add to chutney. If you like you can temper red chilli and curry leaves too. 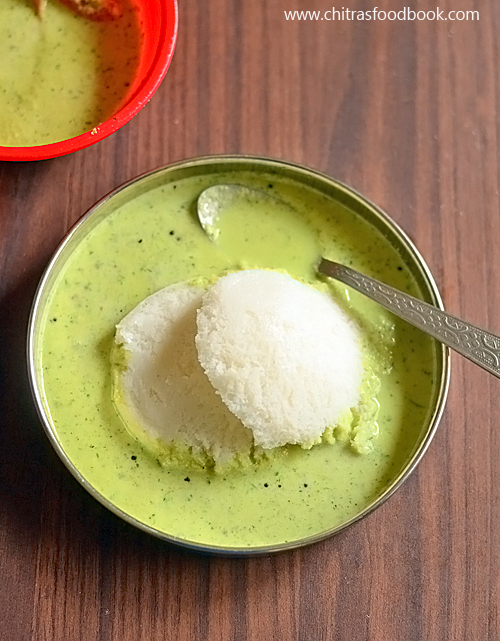 Mix well and serve with idli, dosa ! It stays good for 2 to 3 hours without refrigeration if you do not use your hands while grinding and mixing. It stays good for 2 days under refrigeration.Enjoy ! 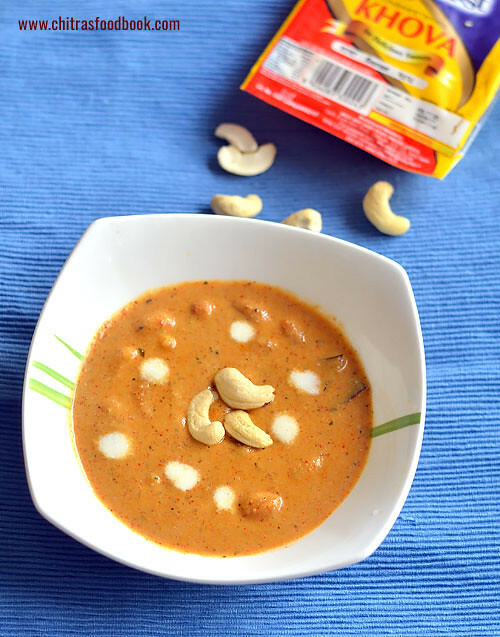 For variations you can skip cashewnuts and add 1 tsp of pottukadalai / roasted chana dal. You can add 1 garlic clove or 1/4 inch ginger for more flavor. 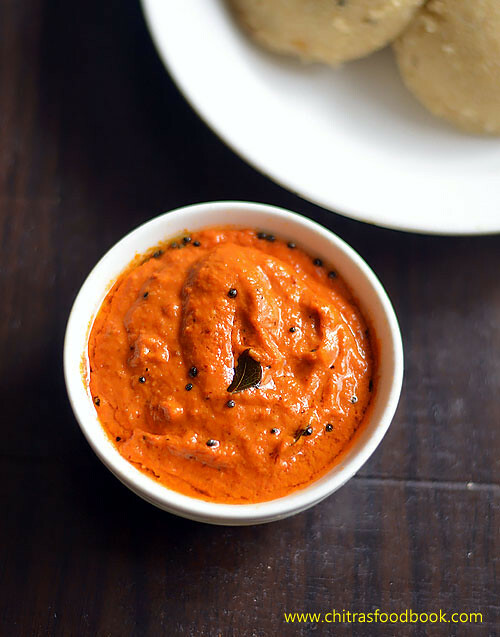 In some hotels, coconut chutney is tempered with red chilli and curry leaves. But I din’t use them. You can also add a pinch of sugar if you like sweet taste in coconut chutney. 1. Always use freshly grated coconut.. Do not grate the brown part. More coconut less pottukadalai/Fried gram is also a must for white chutneys. 2. Add less water for getti (thick )chutney, add the quantity necessary to run your mixie. 3. Indian mixer mate or small jars are a must. American Oster mixer comes with a small jar attachment which also works well. 4. Use small green chillies and always use less green chilies for white color chutney and increase the spiciness by tempering with more red chilies. This answers the question "Why my chutney looks green"? 1. Ready made flakes or desiccated flakes or frozen grated coconut will work but don't except taste and color. Mostly pale white color with oily look. 2. No microwaving for reheating, just thaw to bring back to room temperature. Reheating makes it release more oil and which results in stinky coconut smell. 3. Blender will not work for thick chutney and adding more water will make it thin but consistency will be still coarse. 4.In cold places , coconut leaves oil while grinding chutneys. To avoid this , use hot water or warm water for grinding chutneys. It comes out white & smooth without leaving oil. 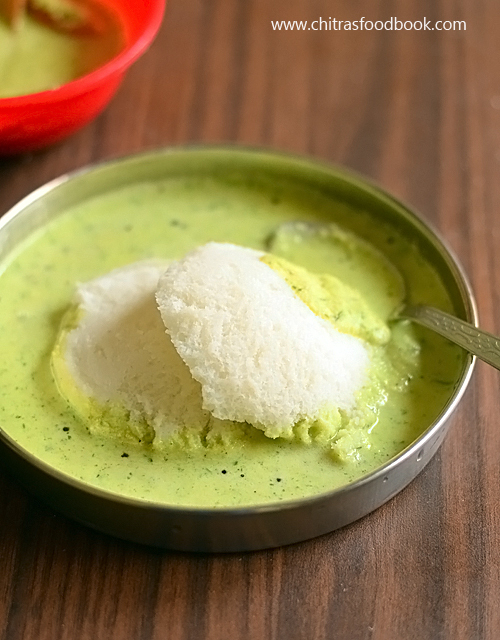 Try this easy, yummy Tamilnadu hotel style coconut chutney / Thengai chutney for idli, dosa ! Its my long time wish to replicate Tamil nadu hotel style kara kuzhambu recipe / Vatha kuzhambu at home. Finally it happened by following this recipe from You tube video. In most of the hotels, this Sundakkai vatha kuzhambu is mentioned as kara kuzhambu. 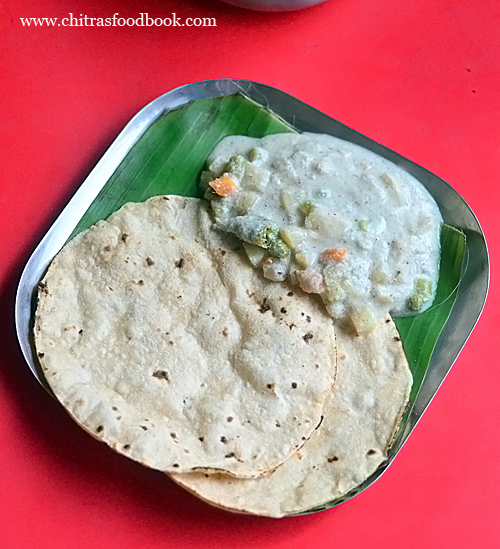 Kara kulambu is the common name used in Tamil nadu restaurants. But we at home differ the names based on the usage of vegetables or dried vegetable vathal. In most of the hotels, sundakkai is used instead of vegetables. For authentic Kara kulambu, we add either brinjal, ladies finger or drumstick and we add ground coconut paste. In some hotels, they add fennel seeds as well. But vatha kuzhambu is prepared with any dried vegetables like sundakkai vathal, manga vathal, manathakkali vathal , Kothavarangai vathal and is usually prepared without coconut. But some people add coconut paste in vatha kuzhambu too. If we make it without coconut, it is called as Puli kulambu and if its with coconut and roasted spices, it is known as Arachuvitta vatha kuzhambu. So the point is, you can call this gravy as hotel style vatha kuzhambu if you add sundakkai vatral. But If you use any vegetables instead of vathal, you can name it as Kara kuzhambu :)). Whatever be the name, the taste of this gravy will surely remind hotel taste to you. I am completely happy with this recipe. 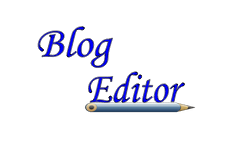 You too give a try and share your feedback with me. This kuzhambu tastes even better the next day. It tastes the best when mixed with hot plain rice. 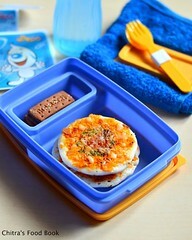 You can serve with any kootu and papad. 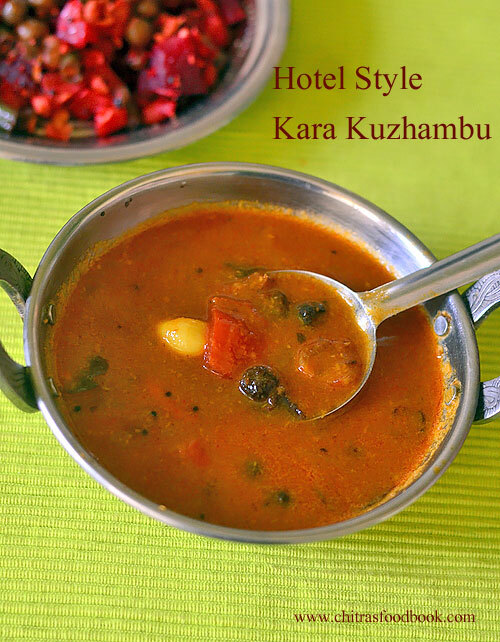 Soon I will share another version of hotel kara kuzhambu with masala flavor. Ok, Lets see how to make hotel style kara kuzhambu adding sundakkai vathal with step by step pictures. 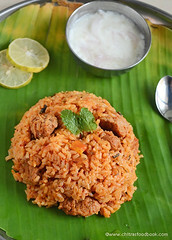 Check out my 60+ kuzhambu recipes ! Soak tamarind in 2 cups water and take the extract. Heat 2 tsp oil in a kadai and roast the ingredients except coconut given under “ to saute & grind”. Add coconut and grind to a smooth paste. Set aside. Heat 3 tbsp sesame oil. Splutter mustard seeds, methi, cumin seeds, urad dal. Saute turkey berry for few minutes. When it becomes golden brown, saute small onion, garlic cloves, curry leaves till onion becomes transparent. Add tamarind extract, jaggery, turmeric powder, coconut paste. Boil till nice smell arises. Switch off the flame when the oil starts to float on top. Transfer and serve with rice. Soak tamarind in 2 cups of warm water for 15 minutes. Wash and peel onion, garlic cloves. Heat 2 tsp oil and roast chana dal, dhania, cumin seeds, 5 small onion, 1/2 of ripe tomato. Saute till tomato becomes pulpy. Add sambar powder, red chilli powder and mix well in medium flame. Do not burn any ingredients. Add coconut, mix well and switch off the flame. Grind everything to a smooth paste. Set aside. Heat sesame oil in a kadai. Splutter mustard seeds, urad, cumin and methi seeds. Add sundakkai vathal and roast till golden brown. Then saute onion, garlic cloves, curry leaves till onion becomes transparent. Now add tomato and saute till mushy. Add 2 cups of tamarind extract, jaggery, turmeric powder, salt, ground coconut paste. Add little water if its too thick. Boil for few minutes in medium flame till oil starts to float on top. 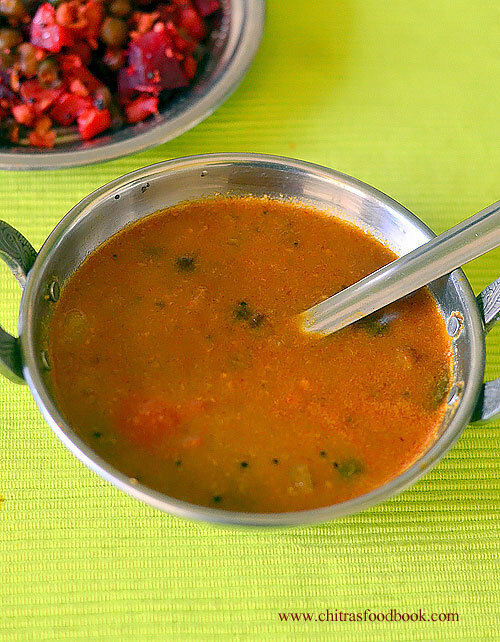 Try to make this kuzhmabu 2 to 3hours in advance for all its flavors to blend well. It tasted much better the next day. Enjoy ! For variations, you can add roasted sundakkai vathal at the end after switching off the flame. It helps to give crunchy taste. You can also grind 2 roasted sundakkai with coconut if you like slight bitter taste in the gravy. Do not skip the ingredients given under “to saute & grind”. It helps to give the hotel flavor. In some hotels, they saute 1/2 tsp of fennel seeds along with other ingredients in the coconut masala. For best taste, give more resting time for this kuzhambu. Yummy, tasty Hotel style kara kuzhambu with sundakkai vathal is ready to enjoy with hot plain rice and poriyal / kootu, Papad ! I served it with banana flower kootu. 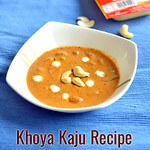 I have never heard about khoya kaju gravy until my reader friend Dheepika requested me to try this recipe after having in an Indian restaurant. 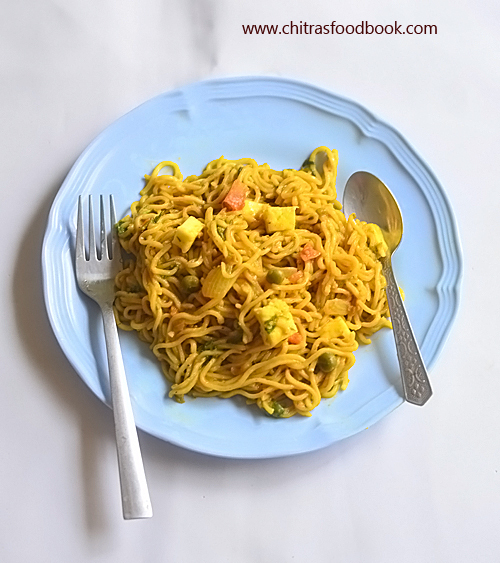 When she told me about this recipe, I browsed and shared the recipe links from 2 different websites to her. She went through them and told me about the color & texture of the gravy along with a picture of one she had in the restaurant.When I browsed for the recipe, I found khoya kaju gravy tastes sweets with mild spices basically.But Dheepika told the restaurant people made it red in color by adding red chilli powder as they asked for a spicy version. Based on her inputs, I followed the recipe of white based khoya kaju curry from spice up the curry and I used red chilli powder in place of green chillies.I tried it yesterday for our dinner.After tasting this, Sendhil told Khoya kaju curry would be white in color in most of the hotels. Some people may add food color to present it red in color, he added. Whatever it is, gravy came out delicious and very flavorful.We loved it with roti. Thanks to you Dheepika for making me try this restaurant style gravy. Soon I will try to share the recipe of khoya kaju white gravy. Though this gravy is very high in calories with full of ghee, cashews and khoya, everyone must give a try at home as it tastes so good & delicious . 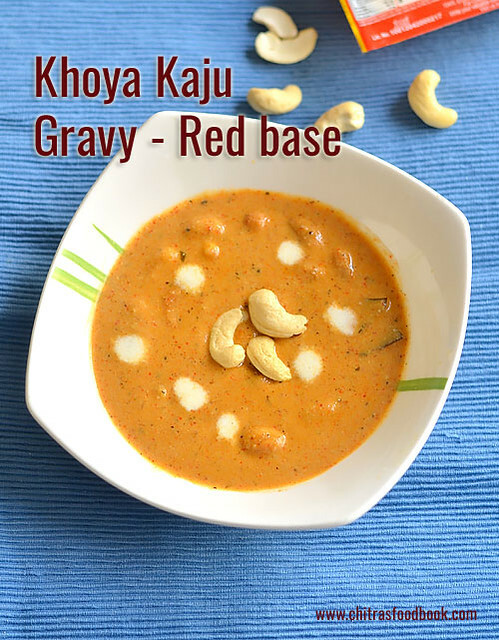 We can indulge in these type of gravies at least once in a while for celebrations and occasions.So friends, do try it and share your feedback with me .Lets see how to make this restaurant style khoya kaju gravy with step by step pictures and video ! In a wide bowl, take the chopped onion, cashews, pepper corns, cinnamon, cloves along with water. Boil and cook for 5 minutes till onion turns soft. Grind everything to a smooth paste and keep aside. Heat oil + ghee in a good non-stick pan and roast the cashews till golden.Remove in a plate. In the remaining oil+ghee, saute bay leaf and add the ground onion paste. This paste gets stuck to the bottom easily as it has cashews.So keep the flame very low and mix it till thick. Scrape the bottom and sides if needed and mix well. Add red chilli powder, coriander powder, salt, sugar, cardamom powder and garam masala powder. Mix for a minute in low flame. Then add curd and mix well. Add 1 cup of water and boil the gravy till oil starts to float on top. Lastly add the crumbled khoya and mix well. Gravy look orange in color. Add the roasted cashews,mix well and switch off the flame. Then add crushed kasoori methi, fresh cream and mix well. 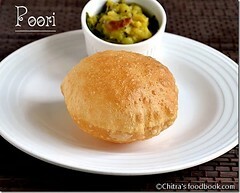 Serve with roti, naan or kulcha ! Reduce the quantity of red chilli powder if you want mildly spiced gravy. Skip red chilli powder, dhania powder, garam masala powder and add green chillies while boiling onions to make a white based gravy. You can add more khoya if you want more creamy gravy. Adding kasoori methi is optional. But it adds flavor. 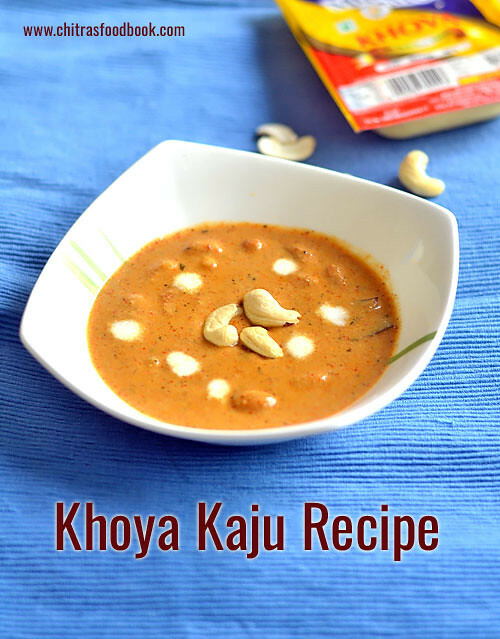 Try this yummy, creamy, rich & delicious Khoya kaju gravy at home !